Aroostook County – Hannah May is currently enrolled in the Structural Welding program at NMCC. Her family moved from Arizona to the Houlton area when she was younger. Hannah remembers growing up as a typical young girl who participated in band and chorus at school with no idea she would eventually be training to become a welder. Her pathway to the trades started at the Region Two School of Applied Technology in Houlton. During high school, she signed up to participate in the Culinary Arts course just to do something different. When she found the course was full she decided last minute to try welding. Although she did not expect to like it, she was still interested in trying something new. This was her first exposure to the welding trade and she found it to be a great experience. Her instructor, Richard Mitchell, was a great support to her and helped her learn some valuable new skills. Before she left Region Two, she completed her OSHA 30 certification a requirement for her current Structural Welding program. 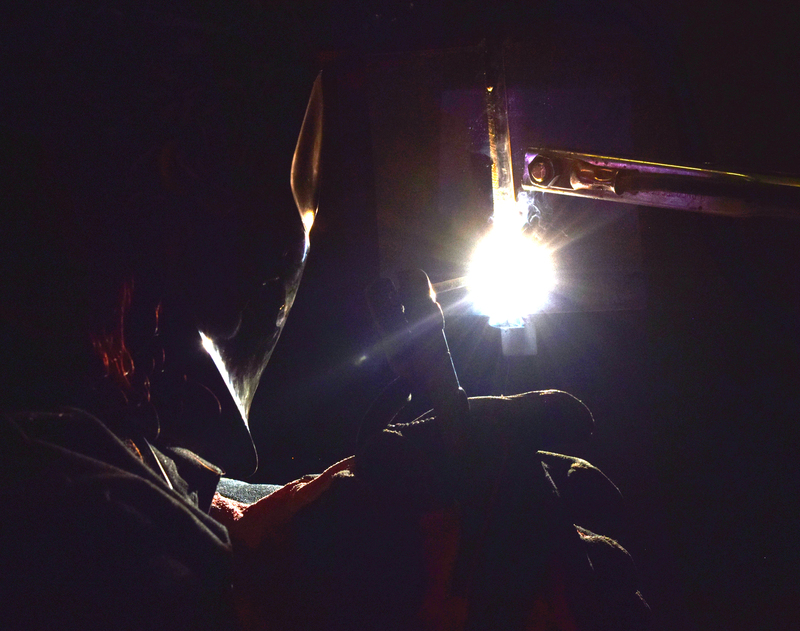 Region Two gave her the exposure and experience to welding that led to a love of the trade. Hannah is attending her second semester at NMCC and will graduate in May. She chose NMCC because it was close to home and an affordable option for her career. The low cost of tuition is a good return on Hannah’s investment in her education. According to O*NET Online, the median wage for welders in Maine is $48,250.00 per year. O*NET also projects 190 open welding positions in Maine between the years 2016-2026. These numbers are encouraging to any welding student who wants to work in Maine. Hannah enjoys her class and lab work and says she gets a lot of hands-on practice along with significant one-on-one instruction from her instructor, Rick Taggett. When she first started this class, she was concerned how others perceived her ability to do the work, because she is female. However, she soon proved her abilities in the lab by the work she was producing. Now she feels confident in her abilities and feels other students respect her for what she can do. Hannah believes her ability to be patient and her fine motor skills are assets to her welding career. Although the Houlton area is close enough to commute, Hannah chose to live on campus. She likes the atmosphere and independence she gets on campus. Instead of commuting two hours a day, she is a short walk to all of her classes. On weekends, she is only about an hour from her home if she chooses. 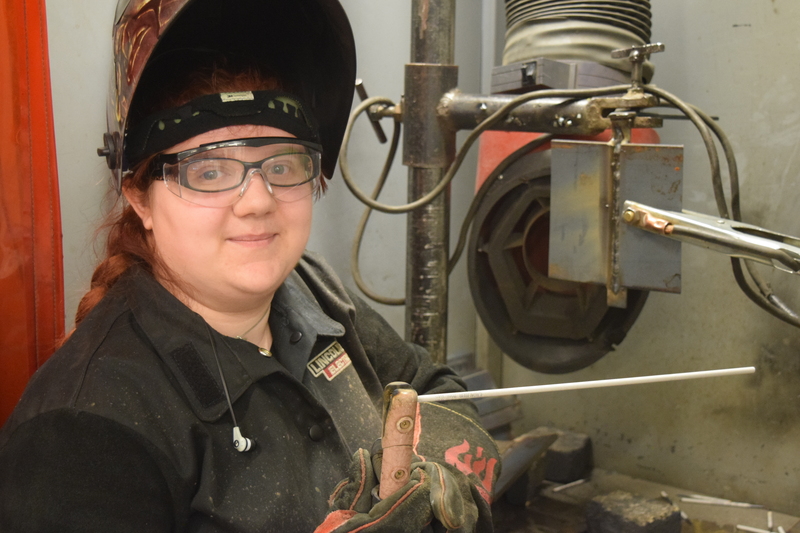 After graduation, Hannah is looking to apply to jobs with companies who specifically hire welders and possibly take part in the apprenticeship program through the WANTO grant administered by ACAP. Hannah’s long term dream is to have her own forge and incorporate blacksmithing, welding and art. She is always interested in doing something different or something no one else is doing. This desire to do something different or unique is a big part of why she got her start in welding. It can be intimidating for a young lady to consider a career in a trade, but not impossible. Hannah is an example of a person who has considered and invested time and money in a trade that is based on her interests and abilities and not her gender. Taking gender out of the equation when considering a career opens up a lot of opportunities for both men and women. Hannah has not limited herself to careers based on gender stereotypes. She has a positive outlook on her career choice and is putting all her effort into welding. It is very clear she is enjoying this process. Hannah encourages any student to consider a nontraditional career. In her words, “Just try it.” It can be intimidating to consider a career that does not fit specific gender stereotypes but a good place to start is the local tech centers such as Region Two School of Applied Technology. There are four Tech. Centers in Aroostook County that can be your first step toward a career in the trades. Hannah took that step! It did not cost her anything! She received a credit to graduate high school and also earned a credit that applied to her college course of study. By the time Hannah started to invest her money in training at NMCC, she was confident in her career choice and is having a successful college experience. Her future is looking very promising. Hannah May is half way through her Structural Welding Certificate Program at NMCC. Hannah demonstrates her welding skills in the welding lab at NMCC. Weld Components in flat, vertical, or overhead positions. Lay out, position, align and secure parts and assemblies prior to assembly, using straightedges, combination squares, calipers and rulers. Operate welding equipment. Have the ability to keep your hand and arm steady while moving your arm or while holding your arm in one position.